This is a nice dish dish for any meat or lentil dish or even eaten on its own!! The delicate flavor of fennel and nigela seeds are all this dish needs. Turmeric provides a subtle flavor and color to this. Its good for people who dont like too much spice in their food. You can adjsut the amount of ginger and green chillies used in this. Ofcourse coriander leaves are a must and i also added some curry leaves found in asian supermarkets. If you cant find curry leaves do not fret…a bay leaf will do ! There are no hard and fast rules ….oh yes but potatoes are a must!! I put these in the oven so they get nice and crispy but they can be made in a non stick frying pan also. Heat the oil in a non stick frying pan and add the fennel seeds, the nigela seeds and the curry leaves for just a few seconds. Immediately add the chopped onion and sautee till onions are transparent adding salt. Put into a baking dish and bake at 200 degrees till potatoes are done. 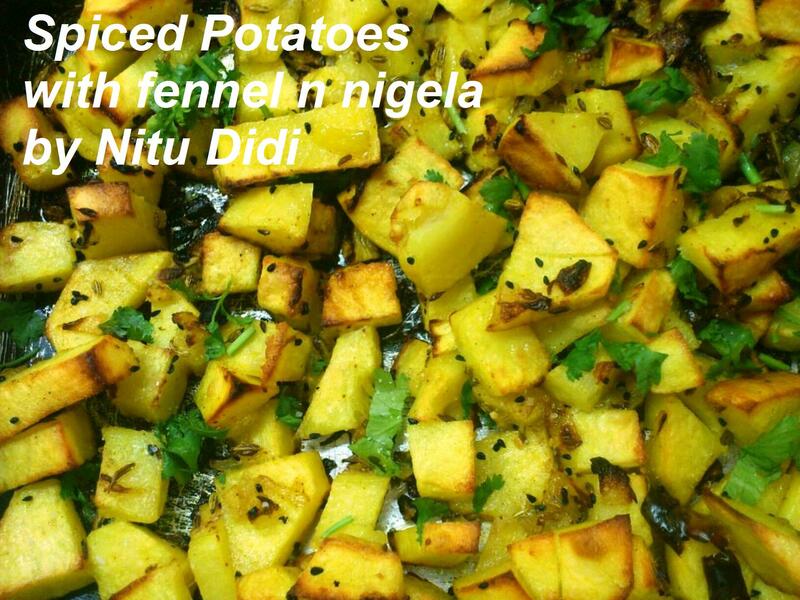 This entry was posted in Everything Vegetarian, Gluten Free, Low Cost, Tupperware Food, Vegan and tagged fennel, nigela seeds, potatoes, vegetarian. Bookmark the permalink. Thanks didi….tell me how much is one ounce of saffron? Chellam one ounce of saffron is about 28 grams…. i charge 5.00 euros per gram so one ounce will be 140 euros for an ounce of the best premium saffron.on my webpage i have an online store.. you can buy there per gram 🙂 thank you and it comes with my guarantee….just like my recipes ! !